Hello and welcome to my Caribbean paradise, St. Lucia! At Spencer Ambrose Tours, we promise you excellent customer service as you embark on an unforgettable excursion through the picturesque island of St. Lucia. I grew up in the small town of Desruisseuax and am a born and bred St. Lucian. I worked as Forest Ranger with the Ministry of Agriculture and served in the St. Lucia Police Force for 10 years. After I left the police force, I was looking for something else to do with my life and I decided to combine my knowledge of the island with my love of its beauty to create Spencer Ambrose Tours. When I started, my vision was to be an ambassador to my country as a proud patriot and I am happy to say I have successfully done just that. Everyday I am given the opportunity to meet wonderful people from different cultural backgrounds and I share my stories of St. Lucia with them. One day, I would love to have a catamaran to add to my fleet and my own thirty sitter so that I continue to share my culture with many visitors to our island. 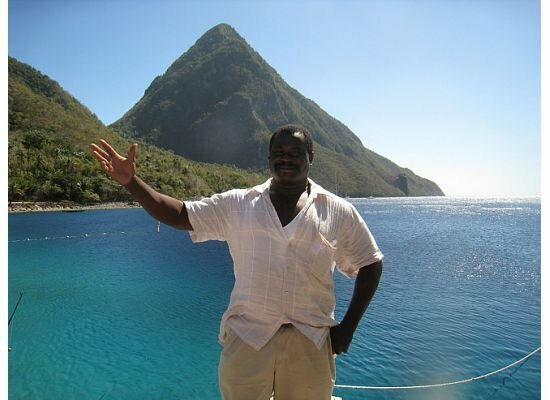 St. Lucia is simply beautiful and it is my goal for you to experience it firsthand. As I continue providing quality tours and personalized excursions, I want to make sure you have the best possible visit. Embark with me on an adventure with unforgettable experiences awaiting you on both land and sea.